Country music singer, songwriter and actor Billy Ray Cyrus has just gotten the green light for a new television series, and as you may have already guessed, it set to air on CMT. Still the King is a scripted comedy that will follow Vernon Brown (Cyrus), a “washed-up one-hit wonder” who gets the boot from the country music scene only to make a revitalized return two decades later as an Elvis impersonator. Nicknamed Burnin' Vernon, for presumable reasons, Brown is known as the second-best pseudo-Elvis in Laughlin, Nevada. However, he is sentenced to return to Nashville for community service after smashing his vehicle into a tattered church while amidst a drunken stupor. Over the course of his journey he not only pretends to be the new minister of the congregation, he also finds out he has an enstranged 15-year-old daughter. Still the King is co-written and executive produced by Cyrus with Hideout Pictures set to produce. Co-writer Potsy Ponciroli, who previously produced Rick Alverson's Gregg Turkington-vehicle Entertainment, is on board to direct. Per CMT, he will also executive produce alongside Cyrus, Travis Nicholson, Shannon Houchins, Julia Silverton and Jayson Dinsmore. Still the Kingsounds mighty entertaining and perfect for the country star. Cyrus has proven on numerous occasions to be an entertaining actor, most recently appearing in Sharknado 2: The Second One and Newsreaders. 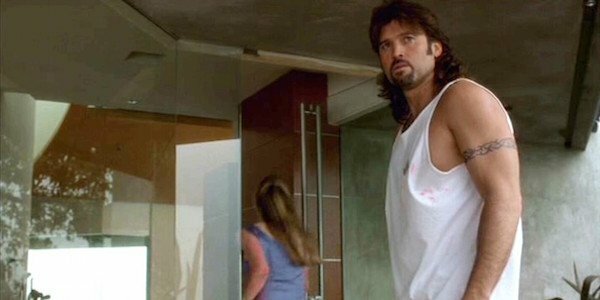 However, for many of us he's probably most well-remembered for his role as the tank-top-wearing boyfriend Gene in David Lynch's Mulholland Drive. Joining Cyrus's new show on the network are several other programs including American Idol finalist Kellie Pickler's brand new series, which is going by the working title I Love Kellie Pickler. That show will detail the life of Pickler as she was launched into stardom through television show American Idoland Dancing With the Stars. Also on the docket for the network is the first-ever CMT nightly talk show The Josh Wolf Show, which will star comedian Josh Wolf and will be produced by Chelsea Handler. A coming-of-age docu-series called Gainesville (by the producers of Brick City) has also been given the go-ahead, along with YouTube breakout star Ed Bassmaster's new prank-style series The Ed Bassmaster Show. With a five-nights-a-week talk show (The Josh Wolf Show) and Cyrus' scripted comedy both firsts for CMT, this is the most ambitious effort thus far made by the network. Exec VP of development for CMT, Jayson Dinsmore, told Variety it will be "the biggest, broadest attack we've ever mounted.” The new programs are all part of an attempt to beat last year's mixed results.